payment button but when I click on the wizard nothing happens. Tried different browsers and still nothing. 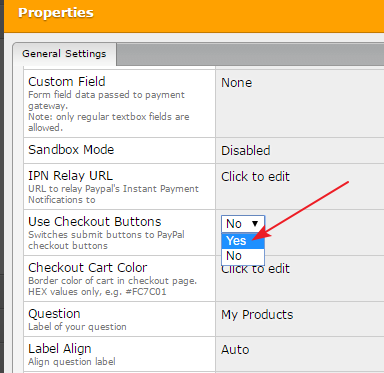 How do I get the PayPal payment button on my form? You may click on the wizard icon of the payment field on the form to access the payment wizard so that you can add the products to the wizard. Please see the screencast below that can help you with adding the products to the Payment field. How do I get the PayPal payment button on my form? Thanks but the property field is not responding either from the wizard pop up or from the tab. Could you try removing the field from the form and then try adding it again so that the wizard should be displayed directly? Tried deleting it and re-inputting it, and still have no joy. wizard to set up. When I click on wizard nothing happens. when I click on the property button nothing happens. When I click on the little blue triangle and get the drop down menu and click on edit properties nothing happens. If you want to discuss on the phone, I can be reached at 843-557-1255. It seems to be a browser specific issue. Could you try logging to a different browser and check if that works? We recommend Google Chrome or Mozilla Firefox to use with JotForm. Unfortunately, we are not offering telephone support at the moment. This support forum is our primary support and your questions here shall be addressed in a timely manner. I use Firefox, and tried I.E. I will try chrome next. Will advise. Sent from my iPhone, please excuse my brevity and misspellings. Thank your for updating us on the status and letting us know all is working now. Contact us anytime should your require assistance again.